Explore the history and natural beauty of Turkey, visit Istanbul's iconic sites such as the Blue Mosque, Hagia Sophia, and the Grand Bazaar. 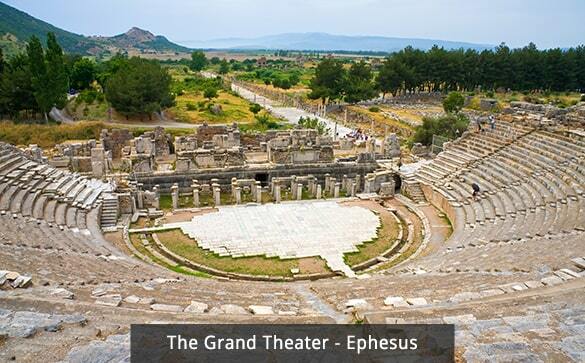 In Kusadasi visit Ephesus the best preserved Roman City in the Mediterranean. 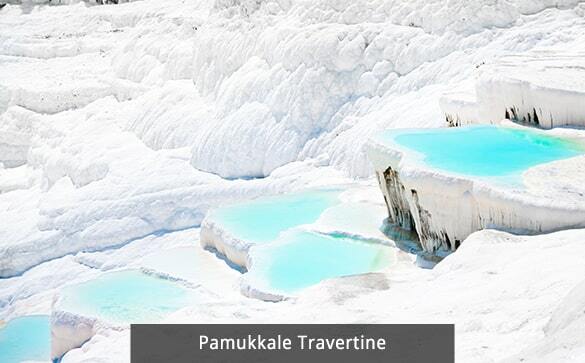 Tour Pamukkale's famous travertines considered the eighth wonder of the world. 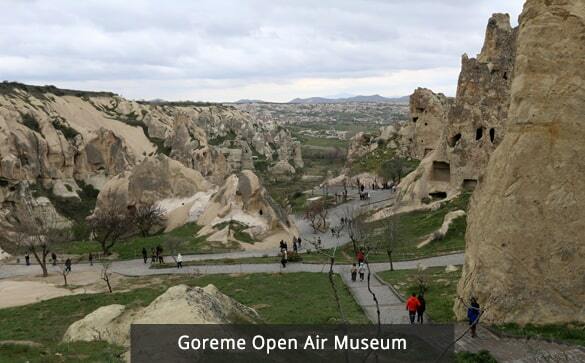 Explore the famous open-air museums and the underground Cities in Cappadocia. Also included visits to the Caravansarai and The Mausoleum of Mevlana in Konya. Our package includes flights, accommodations, most meals, meet and assist services, all transfers, entrance fees, and all taxes there are no hidden costs. Departures are guaranteed. Prices valid for Thursday departures Jan. 10 to May 23 & Sept. 19 to Dec. 5 2019. Prices are higher for departures during Easter and Summer (May 24th to September 19th). Other departures for 2019 available at a higher price. Prices are per person based on double occupancy. Single Supplement USD 599 or CAD 799. 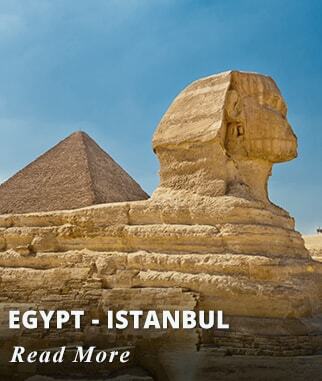 Board your International flight to Istanbul; we offer departures from most major Cities in the USA and Canada. Arrival to Istanbul Ataturk Airport, meet & greet by our Representative and transfer to your hotel. Canadian and American Passport holders require a Tourist Visa that you can obtain online before departure. Accommodation: Grand Yavuz Hotel or Similar. 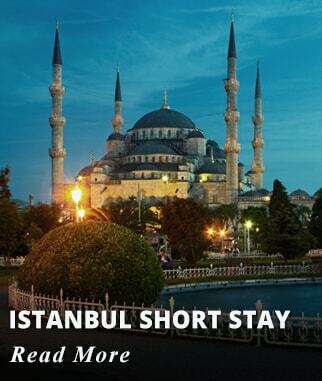 Upgrade at an extra cost to Wyndham Istanbul Old City Hotel. Activities included today: Arrival to Istanbul. After Breakfast at your Hotel join your Guide for Half Day Morning City Tour. Start at The "Sultan Ahmet Center," the heart of the "Old City" from where the Byzantine and Ottoman Empires were ruled. 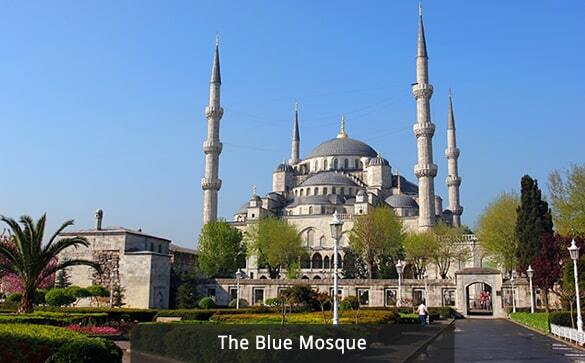 The Blue Mosque, facing Hagia Sophia, famous with its blue İznik tiles and unique with six minarets, built in the name of Sultan Ahmet. Hippodrome, the center of sportive events (chariot races, athletics) and political activities of the old city. Serpentine Column, Obelisk of Theodosius and German Fountain of Wilhelm II are the monuments decorating the Hippodrome. 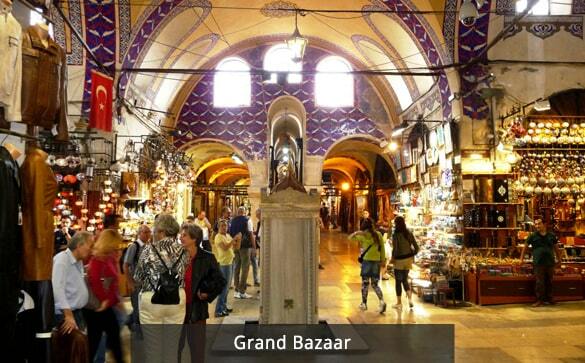 Grand Covered Bazaar, most attractive shopping center and the most significant "souk" in the world with nearly 4000 shops selling antiques, jewelry, gold, carpets, leatherware, and souvenir. Drive back to your hotel. Overnight in Istanbul (B). Activities included today: Half Day Istanbul City Tour. After breakfast at the hotel, transfer to Istanbul Ataturk Airport for our flight to Cappadocia. Upon arrival, meet our Representative who will assist you with transfer to your Hotel. Dinner at Hotel. Overnight in Cappadocia. Whirling Dervish in Cappadocia: The mystical Sufi trance movements of the Whirling Dervishes will delight your senses and take you on a spiritual journey with the live music and graceful movements. Accommodation: Ramada Hotel Cappadocia or Similar. 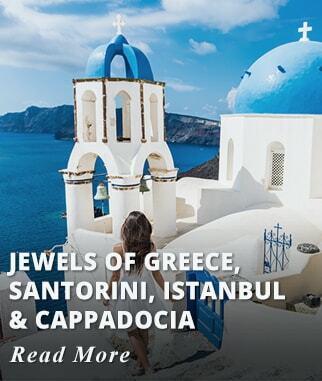 Upgrade at an extra cost to Double Tree by Hilton Avanos Cappadocia Hotel or Similar. 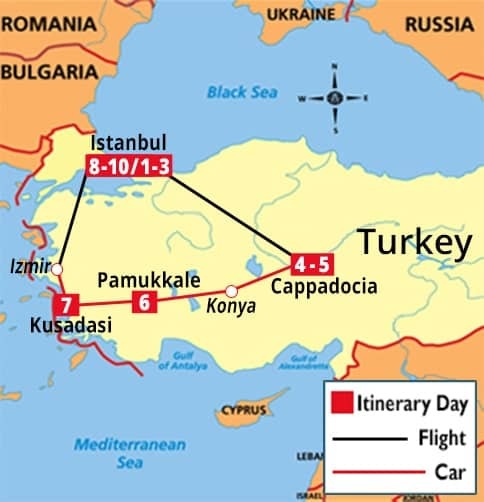 Activities included today: Travel by flight Istanbul - Cappadocia. After Breakfast at the hotel, departure from the hotel for a Full Day Cappadocia Tour. Begin with a stop to take photos at Uc Guzeller which are famed fairy chimneys in Cappadocia. 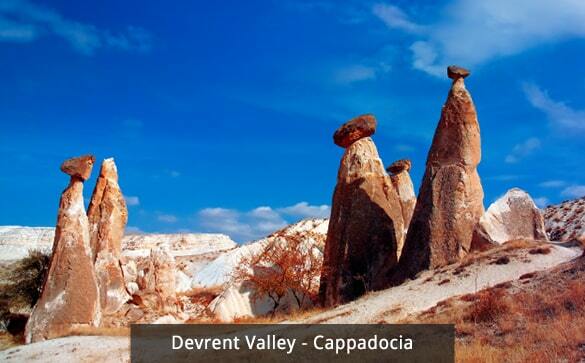 Next, visit Devrent Valley has various types of fairy chimneys. Among these are those with caps, cones, mushroom-like forms pillar and sharp rocks.We will take a walk through this amazing valley. 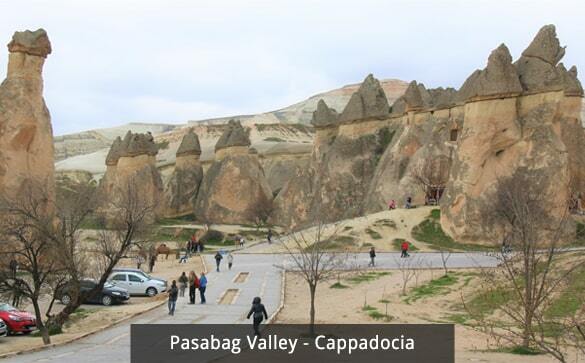 Then, you will visit Pasabaglari (Monk's Valley) where you will see many fairy chimneys with multiple stems and caps can be found here, this style is unique to this area. A chapel dedicated to St. Simeon and a hermit's shelter is built into one such fairy chimney with three heads. After visiting Pasabag, we will drive to Avanos which is known for the pottery, a craft dating back to the Hittite period. The red clay which is worked by local craftsmen comes from the residue in the Kizilirmak river. The Kizilirmak, which divides Avanos into two, is Anatolia's longest river. Enjoy lunch at a local restaurant. Continue to Goreme Open Air Museum. 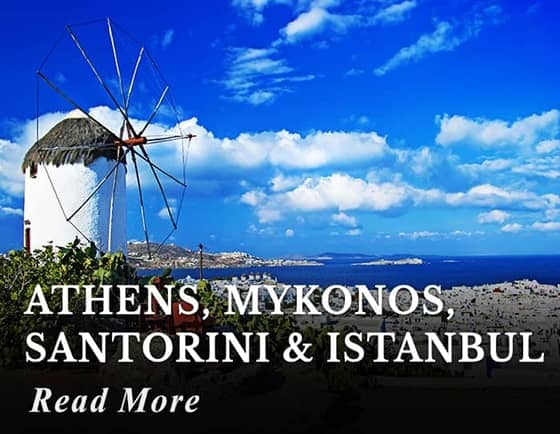 You will visit the churches, chapels, and monasteries carved into the fairy chimneys from the 10th to the 13th centuries with frescos painted on the walls. End your tour with a stop to take photos in Uchisar Castle and Esentepe. 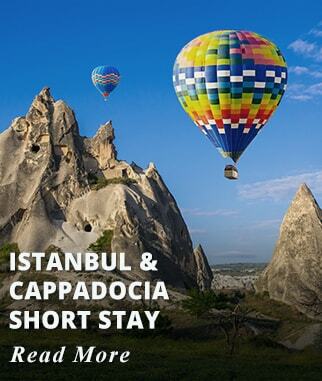 Hot Air Balloon Ride in Cappadocia: Depart from your Hotel before Sunrise; the adventure begins, as you drift over the valleys of Cappadocia as you admire the dreamlike landscapes. 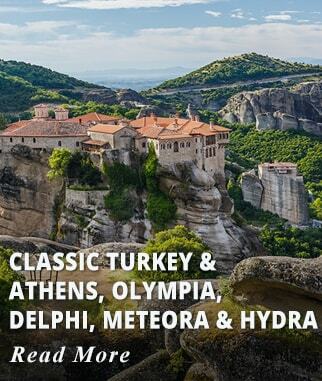 EUROS 150 per person Book and pay locally. Activities included today: Full Day Tour of Cappadocia. After breakfast at the hotel, we will drive to Pamukkale via Konya. Today's ride will be relatively long and tiring due to the long distance between Cappadocia and Pamukkale and lack of convenient lodging location. 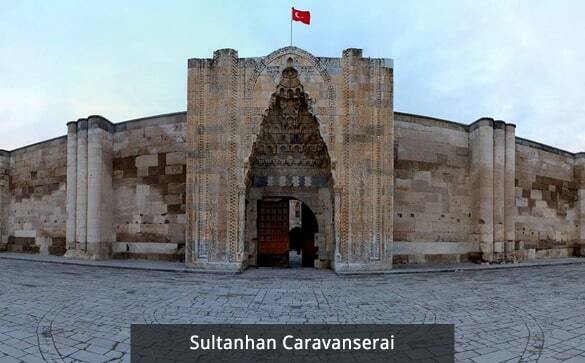 En route we will visit The Sultanhan Caravanserai: This is one of the largest caravanserais in the world and is considered one of the most significant masterpieces of the Seljuk Period. This massive structure was built by the famous architect Muhammad bin Havlan el-Dimiski between 1228 and 1229. During the Seljuk Period, this caravanserai was used by merchants as a roadside Inn. Continue to Konya Center to visit the Mausoleum of Mevlana, Mausoleum of Mevlana: founder of the mystical movement of "Dervishes." Mevlana Celaleddin Rumi was a Sufi mystic and poet whose poetry is celebrated all over the world for its beauty and spirituality. Highly ornamented, the mausoleum room honors the people who accompanied Mevlana and his family on his journey to Turkey. Proceed to Pamukkale. Upon arrival check in at your Hotel for Dinner and Overnight. Accommodation: Ninova Thermal Hotel or Similar. Upgrade at an extra cost to Pam Thermal Hotel or Similar. Activities included today: Travel by road from Cappadocia to Pamukkale. Enroute visit The Sultanhan Caravanserai and The Mausoleum of Mevlana. The ancient City of Hierapolis, contain extensive archeological ruins from the Greco - Roman and Early Christian periods and is a UNESCO World Heritage site. Some of the highlights are the Colonnade Street with pillars on each side of the street, a well preserved Roman Theatre situated in the middle of the City and a Necropolis. Hierapolis was once a Roman Spa City. Hierapolis is located at the top of the beautiful petrified waterfalls, and terraced basins known as Cotton Palace, visiting these Travertine Formations is one of the most popular and unique experiences when visiting Pamukkale. Enjoy Lunch at local restaurant. After lunch, we will drive to Kusadasi. Upon Arrival and transfer to your hotel. Accommodation: Marina Hotel or Similar. Upgrade at an extra cost to Le Bleu Hotel or Similar. 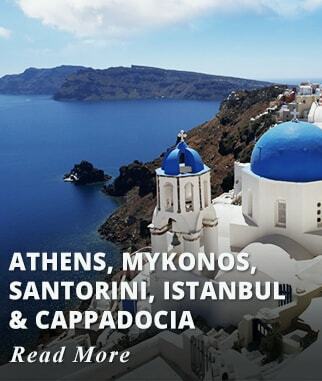 Activities included today: Travel Pamukkale - Kusadasi. Visit Hierapolis and Pamukkale. After breakfast at the hotel, check out of the Hotel then depart for a visit to The Ephesus ruins; Ephesus; the Roman Capital of Asia Minor. The city was first developed as a Port where it was used as an important commercial center due to its strategic location. Today, Ephesus is a popular tourist destination, but back in ancient times, it acted as an important trade center of the world. See the Agora, Odeon and the Temple of Hadrian before continuing along the marble road to the Library of Celsus and the Great Theater of the City. The Ancient Theatre has a 25,000 seat capacity. Enjoy Lunch at a local restaurant. Our last stop will be House of Virgin Mary, where she spent her last years. Continue to Izmir Airport for your evening flight to Istanbul; Flight to depart after 19:00. Upon arrival Istanbul Atatürk Airport our Representative will meet you and transfer to your Hotel. Activities included today: Visit Ephesus. Flight Izmir - Istanbul. 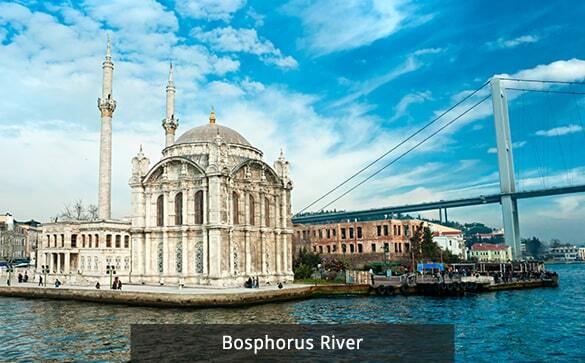 After Breakfast at the hotel enjoy a Half Day Morning Bosphorus Cruise & Spice Market Tour. Proceed to Golden Horn (from the bus), the arm of the Bosphorus and a natural harbor of the historical peninsula separating the old and the new parts of İstanbul where the first colonies settled during the Byzantines. Spice Bazaar (Egyptian Bazaar), mystical smells of different aromas of various spices. Shops are selling fruits, vegetables, fish, flowers, etc. 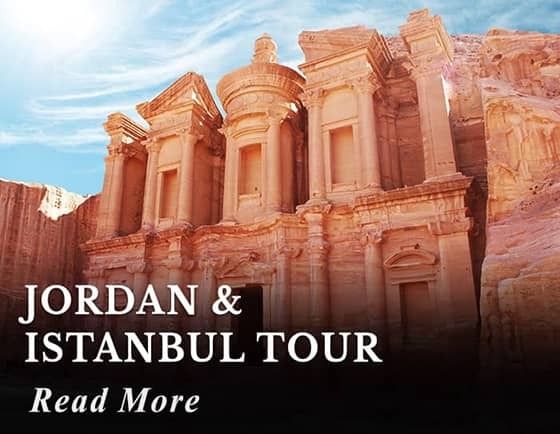 Bosphorus Cruise Tour, through the waterway separating the two continents, Europe and Asia, with a possibility to take photographs of marble palaces, ancient wooden villas of Ottoman architecture besides modern residentials and luxurious apartments. Rumeli Fortress (from the boat - no interior visit), historical armament built by the Conqueror to control and protect the Bosphorus. A unique example of military architecture. Accommodation: Grand Yavuz Hotel, or similar. Activities included today: Half Day Morning Bosphorus Cruise & Spice Market Tour. Breakfast at hotel. Transfer to Istanbul Ataturk International Airport for your return flight. Day Trip to Bursa: Extend your stay for one more night in Istanbul. Depart by Ferry Boat to Yalova then drive to Bursa. At the foothills of Mount Uludağ known for its Historic sites that are dating back from the early Ottoman Empire. 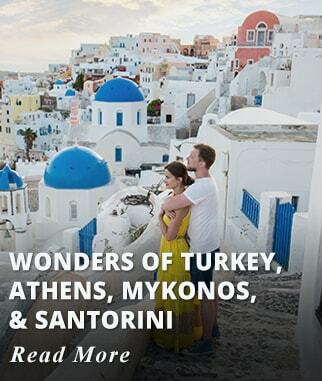 USD 199 Per person based on double - Includes one-night Istanbul accommodation with breakfast and Day Tour. Domestic Flights Istanbul - Cappadocia - Izmir - Istanbul. 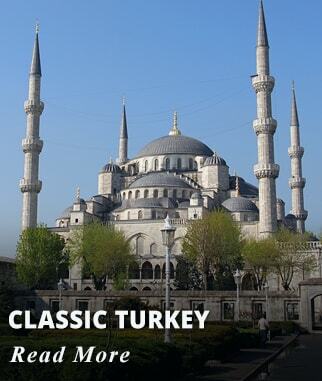 Four nights of accommodation in Istanbul at Grand Yavuz Hotel or similar. 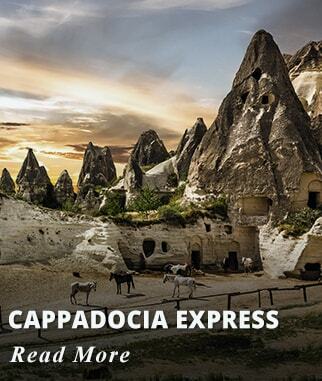 Two nights of accommodation in Cappadocia at Ramada Hotel or similar. One night of accommodation in Pamukkale at Ninova Thermal Hotel or similar. One night of accommodation in Kusadasi at Marina Hotel or similar. 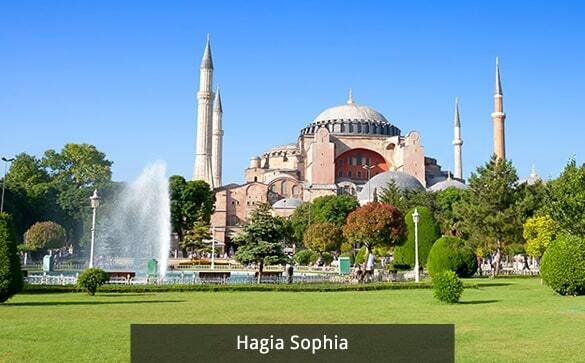 Half day Istanbul City Tour includes visits to Haga Sophia and The Blue Mosque. Full Day Cappadocia City Tour includes visits to Pasabag Valley, Devrent, Goreme open air Museum, Uchisar, Esentepe and Avanos Village. 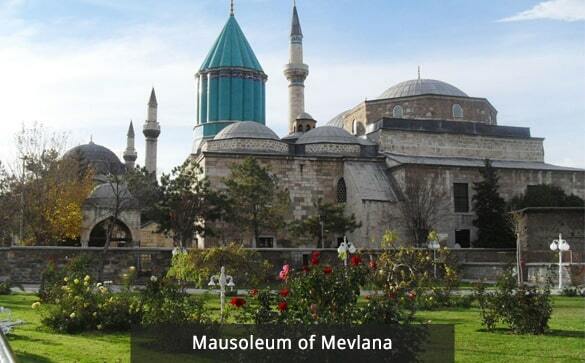 Visit the Mausoleum of Mevlana in Konya. 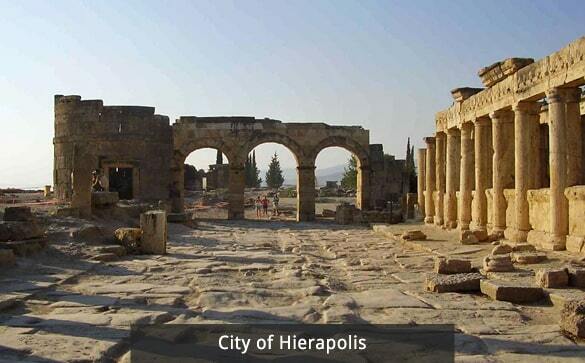 Visit the ruins of Hierapolis. 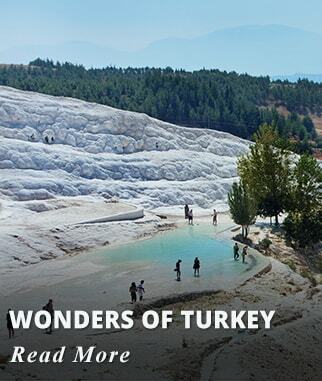 Visit the Travertine Formations of Pamukkale. Visit the Shrine of the Virgin Mary. 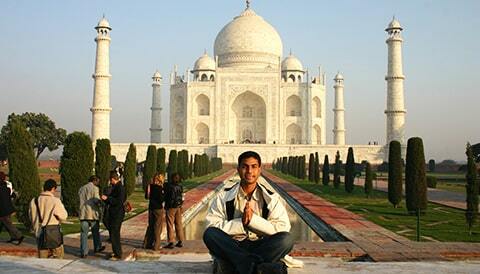 Sightseeing provided by organized Coach Bus Tour with local Guide on each City. 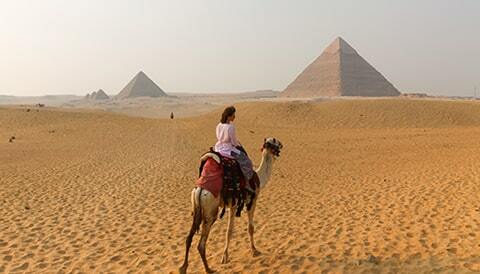 Excursions provided by minibus or mid-bus/coach. All taxes and entrance fees. 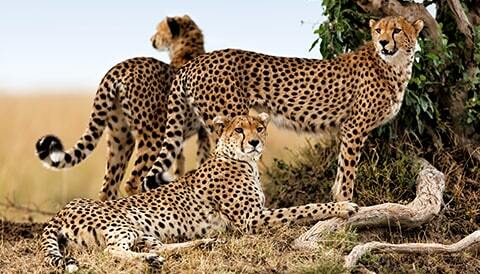 Customary Tips for Guides, Drivers and Hotel Staff.